This dump and start tomato soup made with canned tomatoes is a super-fast route to a tasty and wholesome bowl. Simply add all the ingredients to an electric pressure cooker, cook for a few minutes and allow to depressurize naturally for a few more. Blend and serve. It’s that simple! Slimming World syn free. Vegan & gluten free. 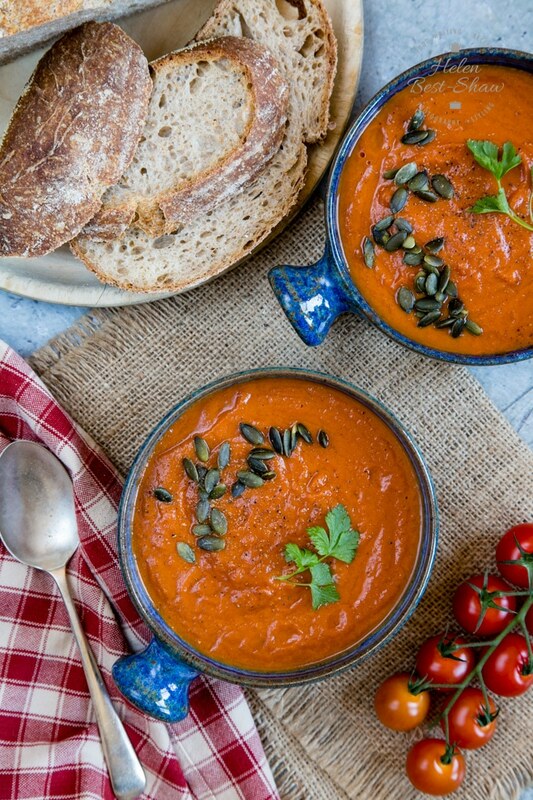 Sometimes, I just want a warming and hearty tomato soup. I could open a tin, but this is a far better solution: a fat-free, low-calorie recipe where I bung everything into my Instant Pot electric pressure cooker and just press go. Six minutes later it’s cooked. I leave it for a few minutes for the natural pressure release (NPR), then blend and serve. It’s vegetarian, vegan and gluten free (if using gluten free tamari rather than soy sauce). It’s suitable for the 5:2 diet and the basic version is Slimming World Syn-Free. Our secret ingredient is lemon juice – squeeze some in just before serving and it really adds a zing and lightness to the finished soup. I had always thought that frying the onion and garlic was the absolutely essential first stage for making soup, but this recipe proves that it’s not the case. Cooking everything together saves so much time, but the end result is still delicious! 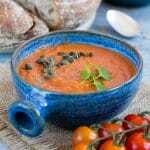 This Instant Pot easy tomato soup is one that you will use over and over again. Fuss Free Tip – when using canned or tinned tomatoes you get what you pay for. A better brand is well worth the extra cost in terms of flavour, colour and texture. No need to buy the most expensive, but don’t buy the cheapest. 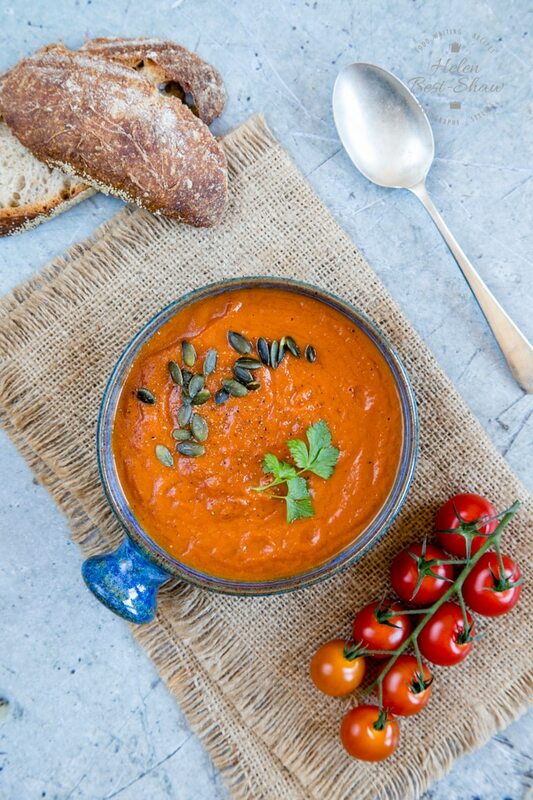 Step one – Pour the tinned tomatoes into your Instant Pot. 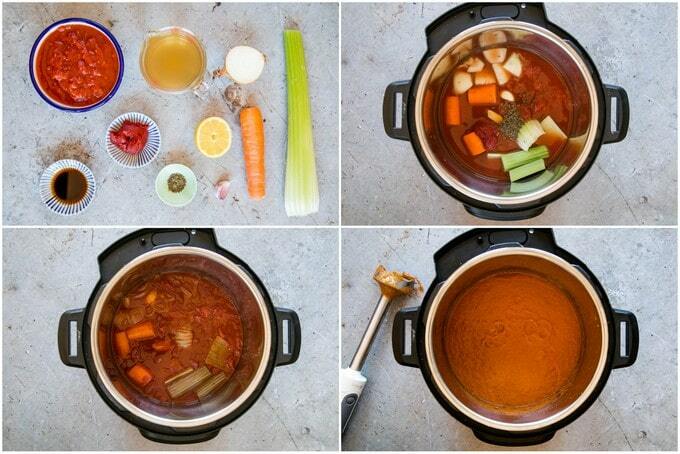 Step two – Tip some of the vegetable stock into the empty can to pick up all the tomato juice. Pour the stock into the Instant Pot and stir. Step three – Add all the other ingredients except for the lemon juice (reserve the nut butter and sun dried tomatoes too, if you are using them). Season with salt and pepper. Step four – Secure the lid on the Instant Pot (check you have put the seal in) and turn the weight on top to ‘sealing’. Step six – Once cooked, leave the Instant Pot on automatic ‘Keep Warm’ for 5 minutes NPR (Natural Pressure Release). Then release the pressure valve. Step seven – Once the pressure is released, open the pot and use an immersion or stick blender to process until smooth. Fuss Free Tip If blending hot using a jug blender, don’t seal the jug closed, but loosely cover the hole in the jug lid with a piece of kitchen paper that you hold in place with a clean cloth. If you blend the soup with the lid sealed down, the pressure will build and explode, sending hot soup all over the kitchen. Step eight – Add the nut butter, tahini and/or sun dried tomatoes if using, and blend again. Squeeze in some fresh lemon juice (or add a cube of frozen juice). Check the seasoning and adjust if needed. Serve immediately, garnished with your favourite seeds and fresh herbs. A few sun dried tomatoes add another layer of flavour. Mix up the herbs or use fresh. Try herbes de Provence, basil, thyme or oregano. Add a spoonful of pesto. Add a dash of chilli sauce. You get what you pay for with canned tomatoes – it is worth buying a premium; but not the most expensive, brand. Lemon juice – squeeze lots at once in your juicer and freeze in ice-cube trays. Store in the freezer, sealed in plastic boxes or bags. The cubes are endlessly useful. This soup freezes well. I pack it into 500 ml plastic boxes which is the perfect portion for two. Allow it to defrost in fridge or microwave then reheat. If freezing, try using half the volume of stock (make it double strength) Freeze the concentrated soup in muffin cases, then pack into Ziplock bags. Add the frozen soup portions to a pan with half a cup of water per serving, and cook from frozen. 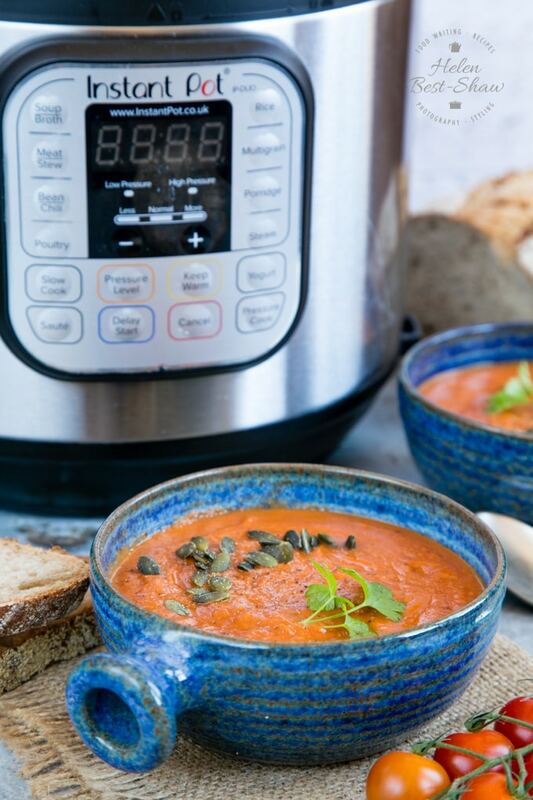 If you try this Easy Pressure Cooker Tomato Soup – Dump & Start please tag #FussFreeFlavours on Instagram or Twitter. It is amazing for me when for me when you make one of my recipes and I really do love to see them. You can also share it on my Facebook page. Please pin this recipe to Pinterest too! Thanks for reading Fuss Free Flavours! Pour the can of tomatoes into the Instant Pot. Use the vegetable stock to rinse out the empty can, and add to the pot and stir. Layer all the other ingredients on top (reserve the lemon juice, and nut butter and sun dried tomatoes if using). Season with salt and pepper. Secure the lid on the Instant Pot (check you have put the seal in) and turn the weight on top to 'sealing'. Once cooked, leave the Instant Pot on the automatic "Keep Warm" for 5 minutes NPR (Natural Pressure Release). Then release the pressure valve. Once the pressure has been released, open the pot and use an immersion or stick blender to process until smooth. Add the nut butter/tahini and/or sun dried tomatoes if using. Add the lemon juice and blend again. Check the seasoning and adjust if needed. Serve immediately, garnished with seeds and fresh herbs. You get what you pay for with canned tomatoes - it is worth buying a premium; but not the most expensive, brand. This soup freezes well. I pack it into 500 ml plastic boxes. Allow it to defrost in fridge or microwave then reheat.